This Everyman mini clocks in at 11 pages, 1 page front cover, 1 page editorial/ToC, 5.5 pages of SRD, leaving us with 3.5 pages of content, so let’s take a look! 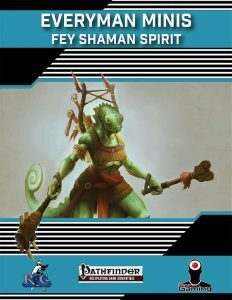 After a brief introduction, which also expounds upon the realms of faerie in a sidebar, we begin with the new shaman spirit included within, the fey spirit: The spirit magic spells provide a nice mixture of fey-related tricks, with invisibility at 2nd and conditional curse at 4th level as remarkable low level tricks. The hexes include a fey-themed disguise self that later upgrades the scaling fey form spells. There is also a 1-minute duration curse that enhances damage taken on a failed Will-save and the old teleport from one plant to another striding, with distance traveled as the limit. Better illusion disbelieving (with see invisibility added at 8th level) and memory lapse-use complement the hex-section, making it, as a whole, feel distinctly fey. The spirit animal gets fast healing 1 at 1st level, which can be problematic in conjunction with HP-sharing abilities. Fast healing should have a scaling daily cap. The sprit ability nets a dual blinding/stagger-gaze with a 1-round duration, which is very strong, but kept from being OP by only affecting a target once per day. The greater ability nets DR and a 10-ft. glitterdust burst. The true spirit ability allows the shaman to 3/day increase the save DC of an enchantment, illusion or transmutation spell. The capstone is a fey apotheosis that nets immunity to death effects and fast healing 5, as well as respawning in the faerie realms after death, with a 1/month cap. The pdf also includes an archetype, the fey conduit. This archetype is locked into the fey spirit and replaces the wandering spirit ability with 3 + Wisdom modifier times per day standard action summon nature’s ally II, which improves over the level. As a balancing caveat, no more than one such effect may be in effect at any given time. The ability may also be used for crafting purposes. Instead of 6th level’s wandering hex, the archetype may, whenever the conduit uses the aforementioned summoning ability, choose to call from a lower level spell list and add the fey creature template. Instead of 14th level’s wandering hex, the fey conduit may not call a creature from her highest level summoning list with said template applied, but only Wisdom modifier times per day. Basically a fey summoner archetype. Okay, I guess. The pdf also includes a new spell, available at 6th level for druid, shaman, sorcerer/wizard: Pixie pollen. Oddly not included among the spirit magic spells of the fey spirit, in spite of being a perfect fit, this spell can target up to 6 creatures with a batch of specifically-created pixie dust. Unique: When targeting a creature, you choose the duration individually and modify the spell save DC accordingly: Permanent effects have a lower DC. I like this! These allow the caster to make targets behave age-appropriately (using the mental age rules from Childhood Adventures), modify the age of the affected, reincarnate targets (also into 0-HD-critters, for -4 to the DC), erase all memories of the current age category, shrink targets (Microsized Adventures-synergy…) – and that’s not all! The spell is amazing. Potent, yes, but also limited enough, and by far, the coolest thing in this pdf. Kudos! Editing and formatting are very good on a formal and rules-language level. Layout adheres to the new two-column full-color standard of Everyman Gaming’s latest layout style, and the pdf has a nice full-color artwork. The pdf has no bookmarks, but needs none at this length. David N. Ross’ fey spirit is a solid expansion for the shaman. Personally, I was rather underwhelmed by the archetype, and I am not a fan of the easily cheesable first level fast healing. The spell is inspired, though, and elevates this beyond what I’d otherwise rate it as…but not enough to increase the final verdict beyond 3.5 stars, rounded down. You can get this mini here on OBS! Missed the amazing Microsized Adventures? It can be found here! The inspiring Childhood Adventures book can be found here!